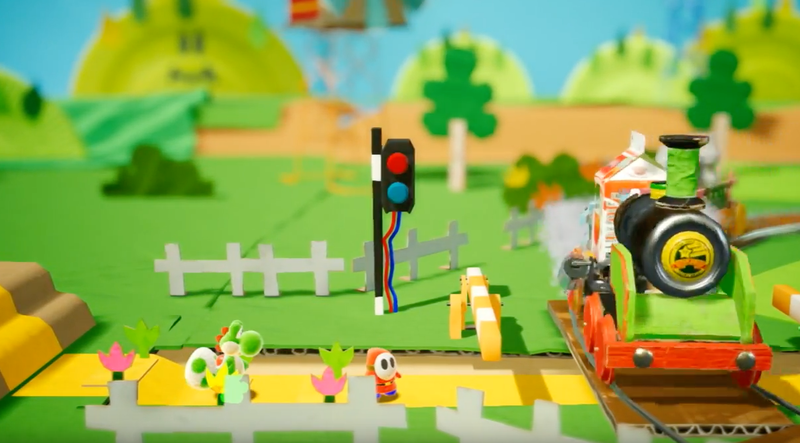 The handcrafted look for the upcoming Yoshi game on the Switch is freaking adorable. When I watched this, I was beaming from ear to ear. Much as I love seeing the cute paper trains and zebras, I also loved watching the flip side and seeing how everything "works". On the back side of the paper town stage, you'll see Shy Guys pulling the moving platforms back and forth — they even work up a sweat. What makes it even cuter is that you can really identify which household object each part of the stage is made out of. You can see milk cartons, paper clips and bottle caps. It makes me want to make a stage of my own. Can't see the trailer but looking at the picture all I can say is, "THAT IS SO CUTE AND I WANT IT NOW!" That new Yoshi game coming out in 2018 will be great I mean the developer GOOD FEEL has a done a good job over the years making a cartoon animated Wii game of Wario Land The Shake Dimension Kirby's Epic Yarn and even Yoshi's Woolly World but that new Yoshi game for the Nintendo Switch coming out in 2018 will be awesome and maybe one day I might get to meet Yoshi when Japan's Universal Studios opens Super Nintendo World in 2020. Keep eating those fruit Yoshi and best of all make those enemies into Yoshi eggs and please don't turn me into a Yoshi egg as well that would be uncomfortable getting trapped inside a Yoshi egg. I was in love the moment I saw the trailer during E3. I'll definitely be picking this up. Maybe it's just me who thinks it looks graphically awful then. To me it just comes off as a tech demo. Woolly world was fantastic as a game and I really enjoyed the art style, but something about this looks really plain and dull to me. Even the gameplay looks clunky. It's early days though so I personally am hoping to see some polish and flair when it comes to the graphics and gameplay. Nah, you're not the only one who isn't that keen on the graphics. I mean I wouldn't go far as to call them awful, but they're not really my cup of tea so to speak either. As you said, it's early days, so perhaps its real worth will become clear in time, but i'm a big sceptical. In its defence though, I'd like to think Nintendo learned their lesson from Yoshi's New Island (did NOT like that one) and that they'll hopefully incorporate what worked from Woolly World, rather than the worst elements in past titles. EDIT - Watching the full trailer, I'm not 100% excited for the foreground background gimmick (at least based on what's shown in the first level). It may just be me, but I kind of preferred Super Paper Mario's take on different perspectives and exploration. Once again though, have to wait and see how well it plays in the final release. Looks very lacking in content, I am keen to get a switch but will probably not be picking this up. Kirby looks much more appealing.